The garden has 360 degree view of Lake Hodges and the surrounding area. The garden is packed with every specimen of succulent Cathy can find. After a visit to Monet's garden in Giverny, France, Cathy modeled the beds and paths in a similar way. The garden style is that of a painter with plants, using textures and colors in combination to create garden scenery. 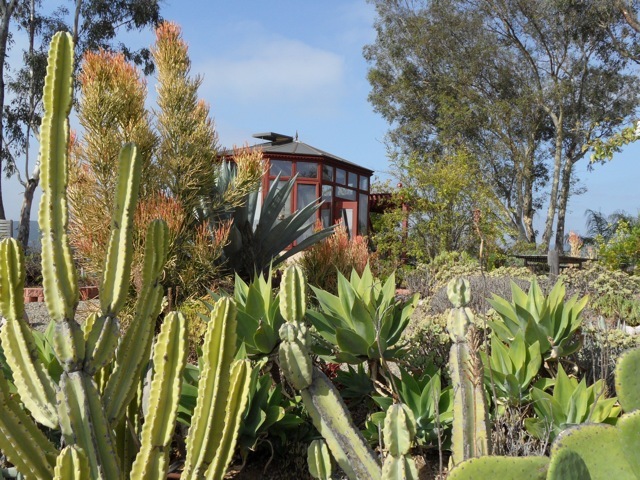 The affect is similar to an English cottage garden, without formal structure, but using a pallette of drought tolerant plants, succulents, cacti and lots of palms. At the top garden is a glass house Cathy uses as artist studio for creating her paintings. 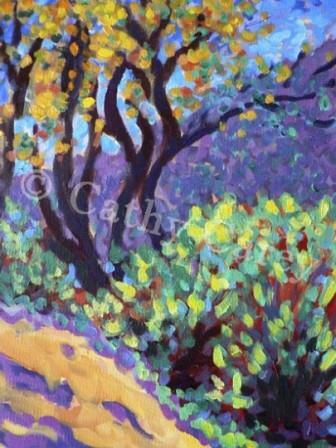 Cathy's paintings will be on display. New this year is the wine bottle garden that curves around the grapevine covered view patio. There is a waterfall that connects the first level to the top, in this slightly less than an acre garden. Greeting guests are their garden ambassadors, 2 Golden Retrievers - Sazi and Yogi.